ADB will help India accelerate infrastructure development, boost manufacturing, improve the skills of young people to enhance their employability, expand trade through regional cooperation, and promote private sector activities. 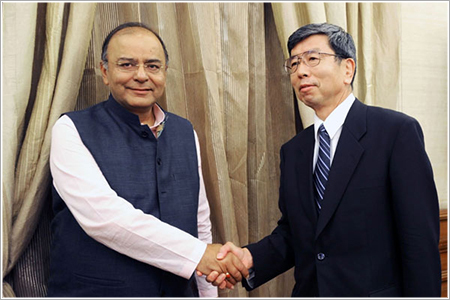 Asian Development Bank (ADB) President Takehiko Nakao met with India’s Prime Minister Narendra Modi and Finance Minister Arun Jaitley and stressed that ADB is committed to partnering with India in reigniting growth and reducing poverty. ADB will help India accelerate infrastructure development, boost manufacturing, improve the skills of young people to enhance their employability, expand trade through regional cooperation, and promote private sector activities. 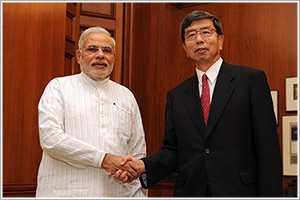 Mr. Nakao said ADB’s operations for India will maintain high levels of lending, amounting to a total of $7 billion-$9 billion over the next three years. ADB will also provide around $30 million for technical assistance grants, especially for building institutions and capacity at the state and local levels. Mr. Nakao applauded the government for presenting a growth-oriented budget, while committing to a path of fiscal consolidation. Going forward, he said, “It is essential to increase capital expenditures as a ratio to GDP, enhance tax revenues through tax reforms such as the introduction of Goods and Services Tax and stronger tax collections, and streamline subsidies by better targeting.” He also encouraged the government to continue the prudent economic management for lower inflation and stable rupee. ADB forecasts the Indian economy will grow at 5.5% in FY2014 (ending 31 March 2015) and expand further to 6.3% in FY2015. “To get back to a high growth path of 8 to 9%, it is also crucial to implement investment-friendly reforms being initiated by the government,” stated Mr. Nakao. Easing the regulatory burden on industry by eliminating red tape and promoting inter-agency coordination, enabling single window clearance mechanisms, and reviewing land acquisition procedures should be part of the national strategy to attract local and foreign investors. Together with efforts to build world class infrastructure and skills, these steps would create the job opportunities needed to absorb India’s youthful and growing labor force and ensure that growth is inclusive. ADB is providing loans to state governments to train young people for modern jobs. Further, its ongoing technical assistance to the National Skills Development Corporation will help establish stronger linkages between private industry and technical and vocational training using public-private partnerships (PPPs). ADB’s President expressed his full support to help realize Prime Minister Modi’s vision on regional integration and connectivity. ADB is providing in 2014 loans amounting to $1.2 billion to projects under the framework of the South Asian Association for Regional Cooperation (SAARC). These include loans and technical assistance to support subregional roads, hydropower generation, cross border power lines, and trade facilitation. In addition to lending to the government, ADB committed about $1.3 billion for non-sovereign operations in 2011-2013. ADB is supporting India’s first concentrated solar power plant in Rajasthan, power distribution systems in New Delhi, and providing credit guarantees of infrastructure project bonds. ADB has also made equity investments in off-grid solar power in rural areas, agribusiness, and renewable power. ADB has been supporting PPP projects through technical assistance and financing through Indian banks. “We will expand ADB’s PPP operation in India through our newly established PPP office at our headquarters,” said President Nakao. To finance rupee denominated lending in private sector projects, ADB last week issued its first offshore Indian rupee-linked bond and raised Rs3 billion (about $50 million). This is a part of ADB’s $500 million offshore rupee-linked bond program and is expected to help deepen India’s capital markets. India is the largest borrower from ADB. Between 1986, when ADB started its lending operations in India, and 30 June 2014, ADB approved 183 sovereign loans totaling $29.8 billion. ADB has also approved 50 non-sovereign loans, equity investments and guarantees totaling more than $3.2 billion.